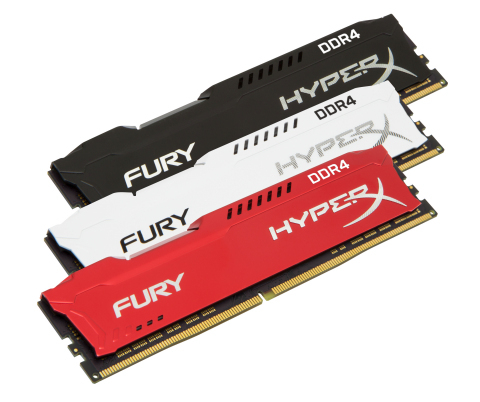 FOUNTAIN VALLEY, Calif.--(BUSINESS WIRE)--HyperX®, the gaming division of Kingston® Technology Company, Inc., today announced the addition of higher frequency memory modules to the HyperX® FURY DDR4 DIMM and HyperX® Impact DDR4 SODIMM product lines. FURY DDR4 DIMMs and Impact DDR4 SODIMMs both offer automatic Plug N Play overclocking functionality. FURY DDR4 is now available up to 3466MHz1 and Impact DDR4 is now available up to 3200MHz. Both product lines are available as single modules and as various kit configurations from 8GB to 64GB. HyperX FURY DDR4 is a cost-efficient high-performance upgrade for Intel and AMD’s latest platforms for faster video editing, 3D rendering, gaming and AI processing. It features Plug N Play, which enables automatic memory overclocking at standard DDR4 1.2V settings. The new FURY DDR4 additions are available in black, red and white low-profile heat spreader color options that feature the stylish signature FURY asymmetrical heat spreader design with black PCB. For additional FURY DDR4 DIMM SKU addition part numbers, please visit https://www.hyperxgaming.com/us/memory/fury-ddr4. 2 HyperX DDR4 PnP memory will run in most DDR4 systems up to the speed allowed by the manufacturer's system BIOS. PnP cannot increase the system memory speed faster than is allowed by the manufacturer's BIOS. Memory overclocking is locked at 2133MHz (Skylake), 2400MHz (Kaby Lake), or 2666Mhz (Coffee Lake) on all mobile processors except H Series Core i7 processors (i7-xxxxHQ or i7-xxxxHK). AMD Ryzen systems will boot at the JEDEC default speed/latency with Impact. In order to enable the factory overclock speed and latency, Profile 1 must be selected in the BIOS.